Is it too early to start on Christmas cards? I guess it is never too early to start so that there is no mad rush towards December! 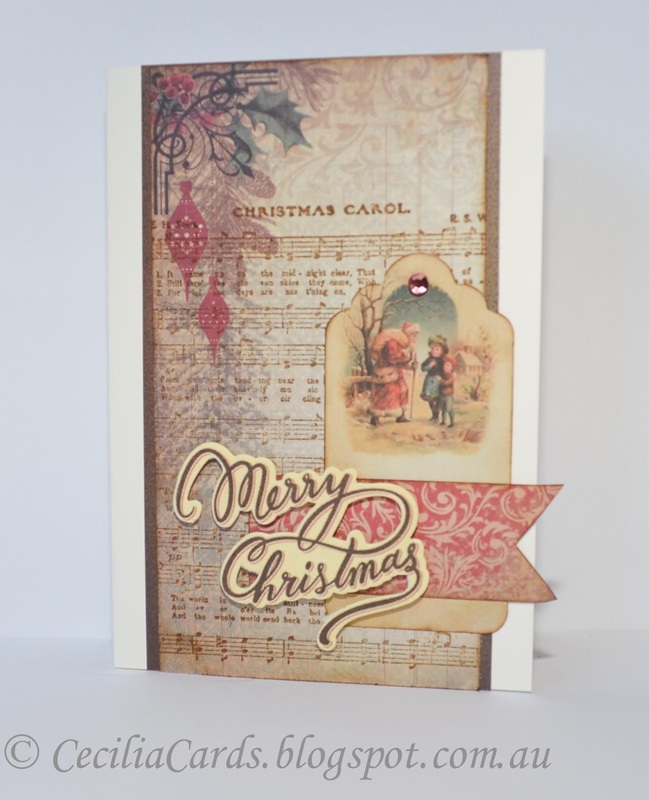 There is a Christmas card challenge at Moxie Fab World and I would like to submit some cards that I have made. These never made it for a publication call. Yes I know, for every card that gets published, there are some that never made it to fame and glory. Never mind, they will get showcased here! 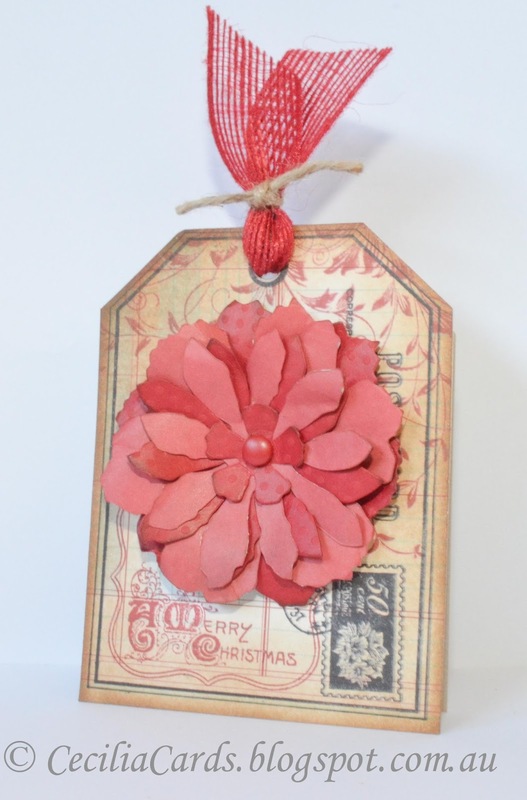 I'm also linking this up to Simon Says Stamp Wednesday Challenge - Anything Goes. Thanks for dropping by! I have not tried a lot of 'Ombre' card challenges in the past. 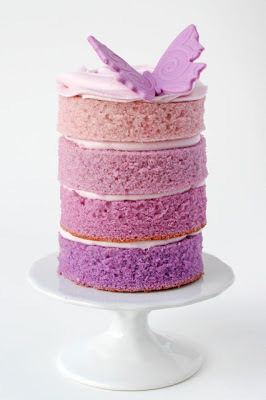 One of the reasons is that I do not have different shades of coloured card stock in my stash and I cannot be bothered getting them just to do an 'Ombre' card! Anyway, when I saw the challenge on Moxie Fab World Tuesday Trigger this week, I wanted to give it a go. I was thinking of shading in shades of purple.. then maybe try different shades of patterned paper.. it all got too difficult again... until I found I had three perfect shades with my Core'dinations card pack (this comes with 2 of each shade in long 2.5 inch wide strips. I was going to do this challenge with a normal sized card, but I was asked to make another A4 card for a maternity leave farewell at work. 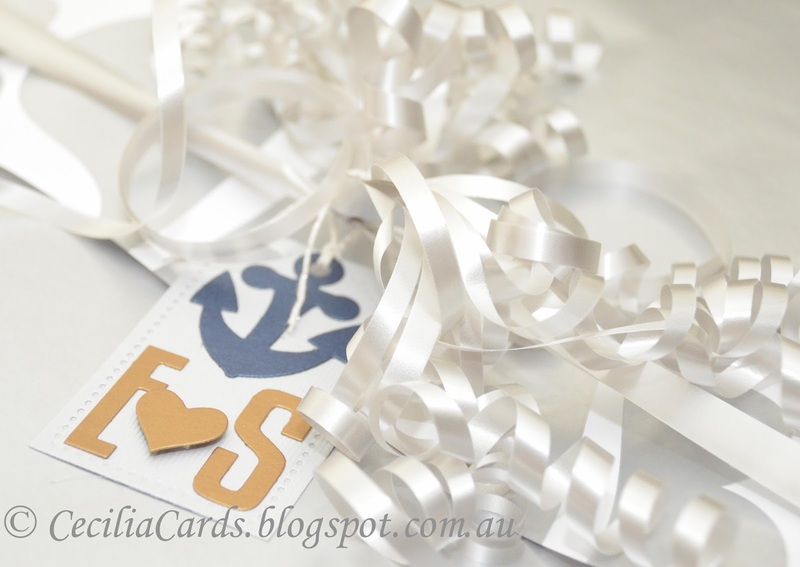 Here is my card, the inside reads 'Best Wishes, XOXO'. 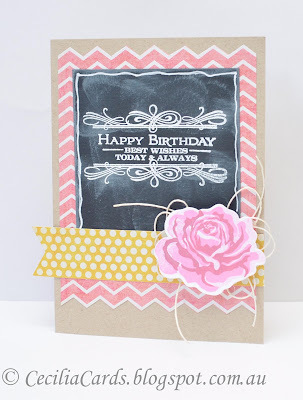 I'm also linking this card to Simon Says Stamp Anything Goes challenge.Thanks for dropping by! 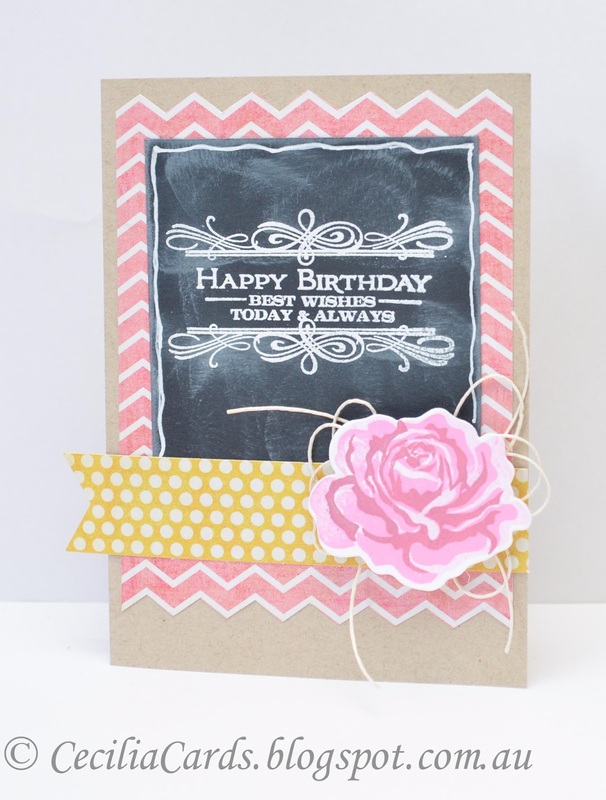 Canson Colorline Card (black and white), Core'Dinations Distress Cardstock, Paper Smooches Reflections and Bloom dies, PTI Bold Wishes, Ranger Archival Jet Black, Pink Paislee lace, American Crafts Brads, Hemp from Hemptique. 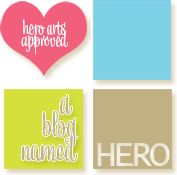 Some of my regular blog followers have seen some of the A4 cards I have made for work friends. Well, we have another farewell at work next week for a very lovely lady whom I work quite closely with. 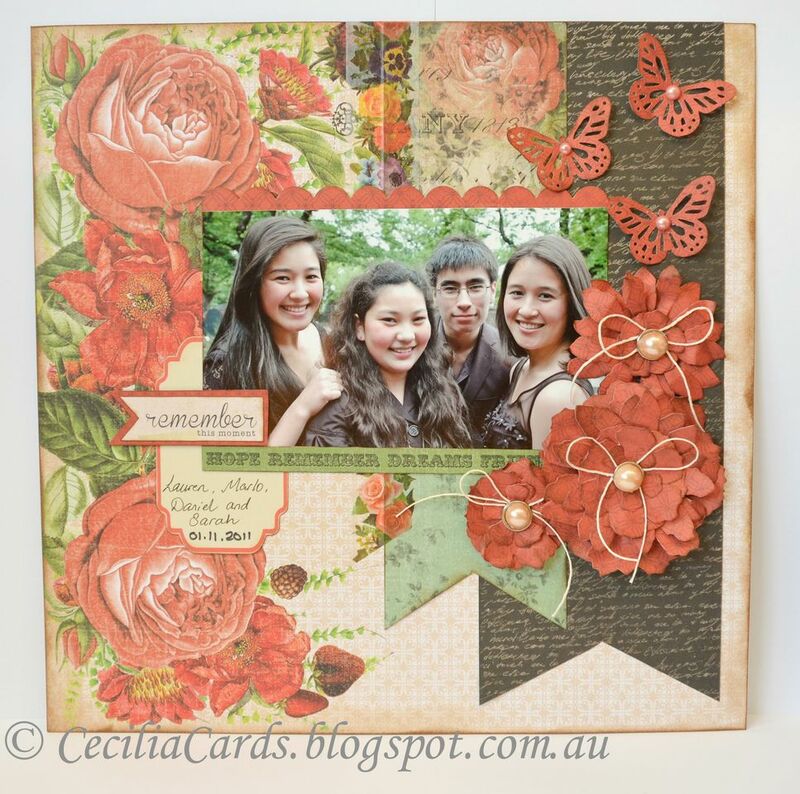 I've been using the Kaisercraft Curiosity collection for some of these big cards as I was given quite a few 12x12 scrapbook pages by Kaisercraft for being in the top 20 for the recent DT call. 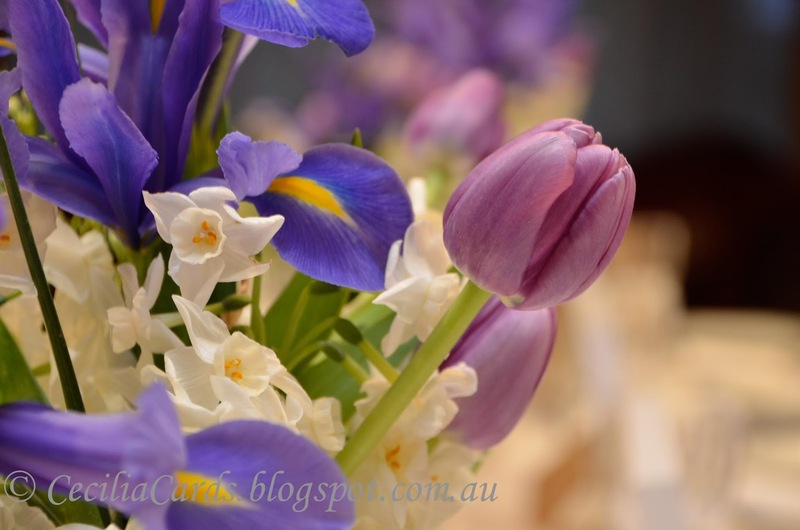 They are great to work with as the colours can be feminine or masculine. 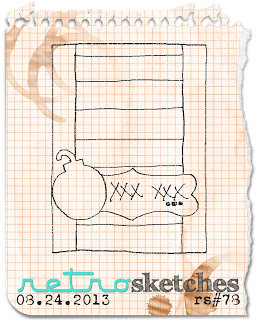 I decided to use this week's Retro Sketch to base my card design on and also Jennifer McGuire's die cutting technique shown here for CASE Study Challenge. Since there is a 'Dotty Challenge' on Simon Says Stamp, I'm linking this card there as well. Thanks for dropping by and all the lovely comments on my previous post! 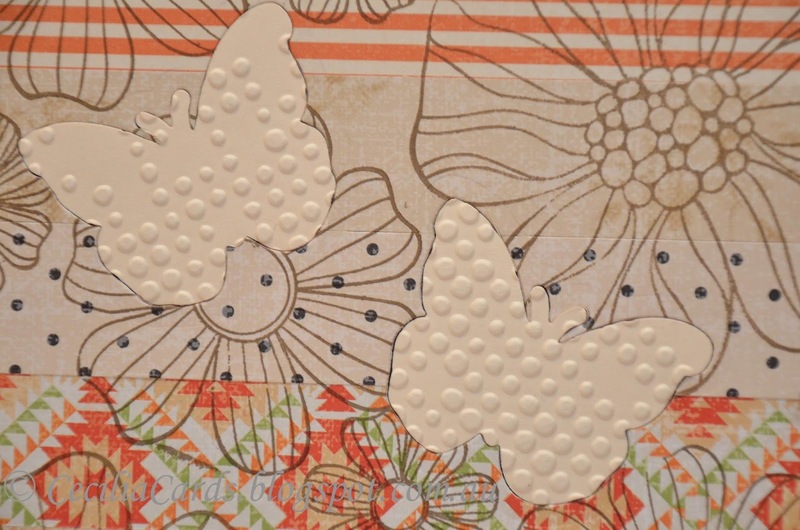 A close up of the die cut butterflies which I decided to emboss as well. Canson Colorline cardstock, Kaisercraft Curiosity, Kaisercraft Collectables - Curiosity, Hero Arts Butterfly die cut, Hero Arts CG255, CL574, CG290, Sizzix Tim Holtz EF, Hero Arts Cup O'Joe, Ranger Archival Jet Black and Kaisercraft pearls. 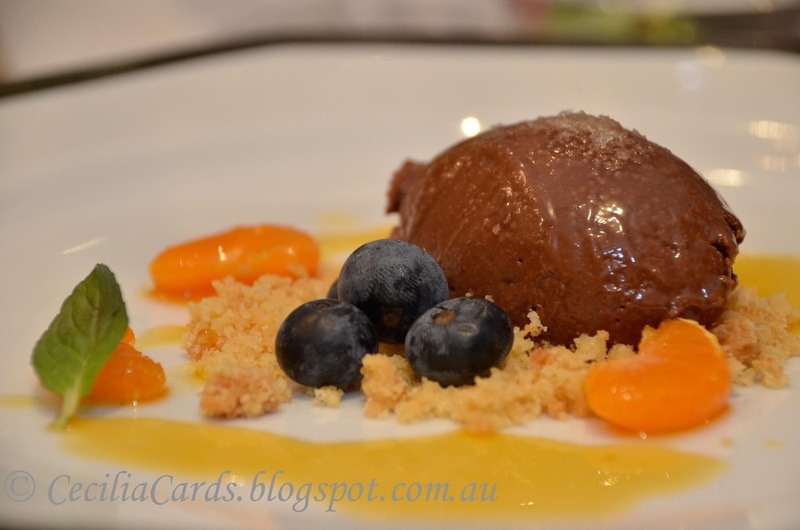 I've been so busy with friends from overseas that I have not blogged for over a week! I am getting withdrawals! 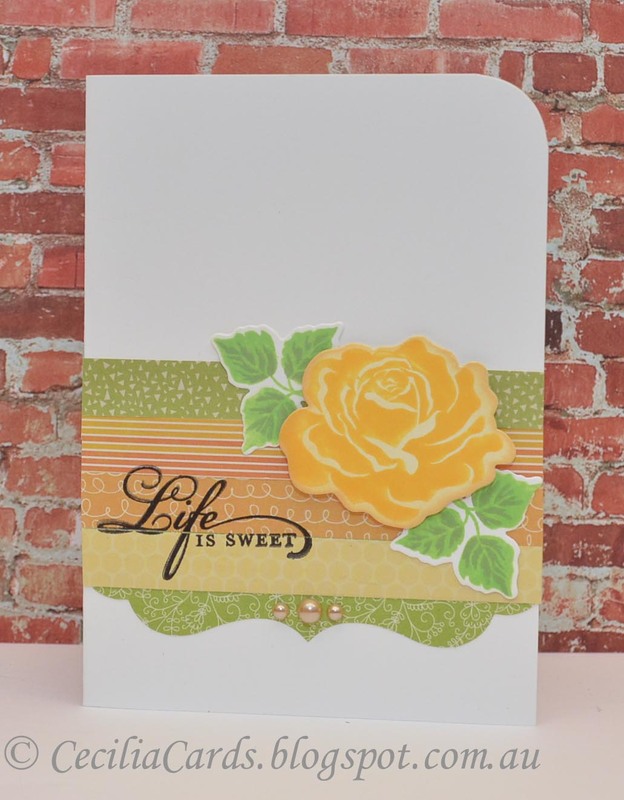 I made this card with the PTI The Sweet Life for the August Blog Hop. 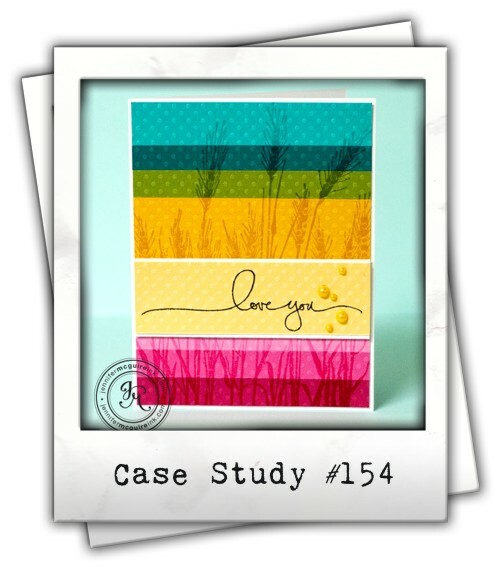 I've decided to add this card to CASE Study challenge 154 - Casing Jennifer McGuire. I'll also like to share some photos from the weekend of entertaining our overseas guests. 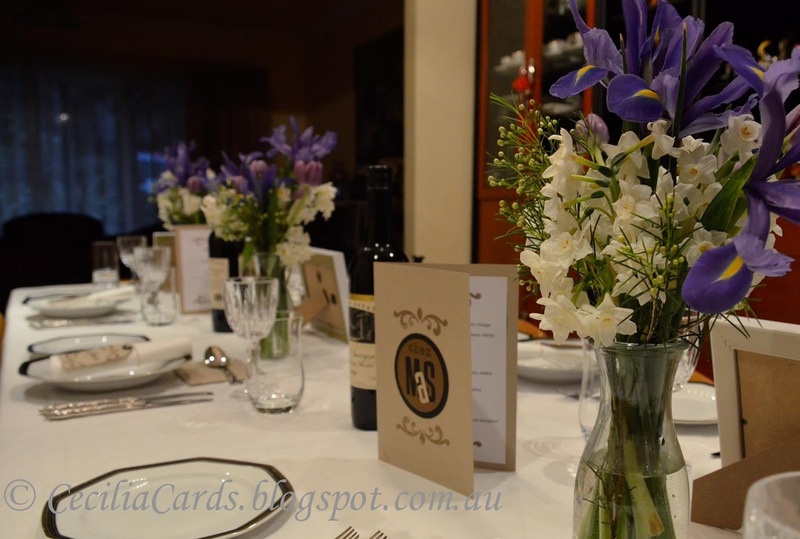 We held a dinner party at home with our house guest/chef's family. He catered for the evening with fine dining French cuisine. Since I didn't have to cook, I spent time setting the table and prepared a menu and place settings for our guests using a PTI stamp and die. 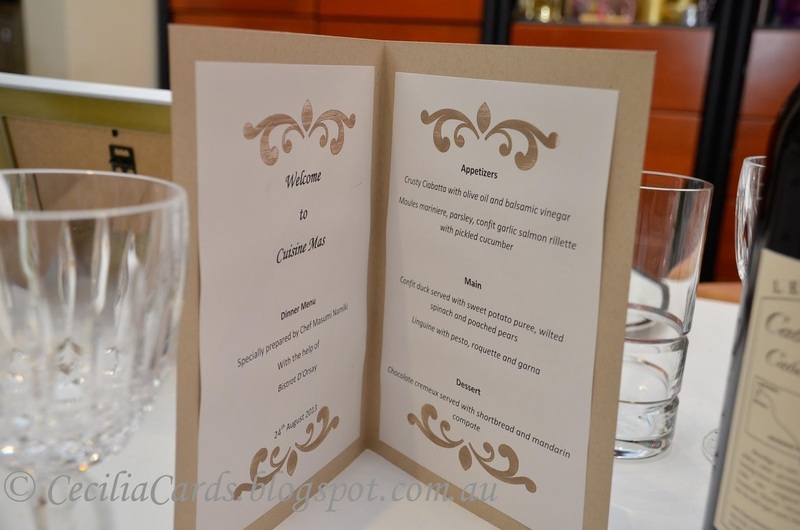 I made a logo using alphabet die cuts and used this on the menu and made name cards for the Chef and his 'trainee/girlfriend/waitress'. 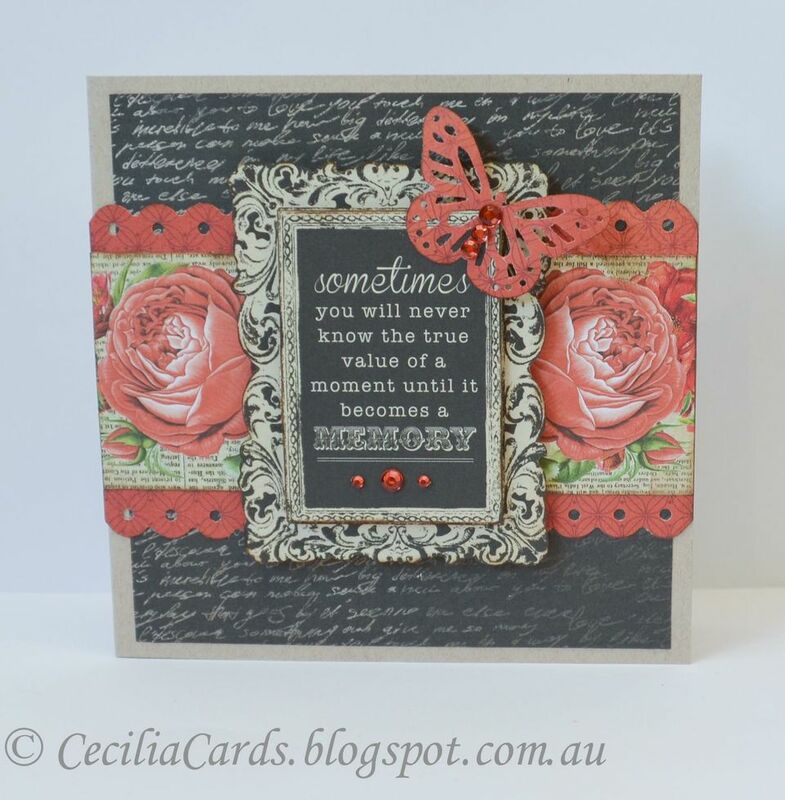 I swiped the stamp with the ink pad to create a streaked effect (I quite like this distressed and non-fussed look). 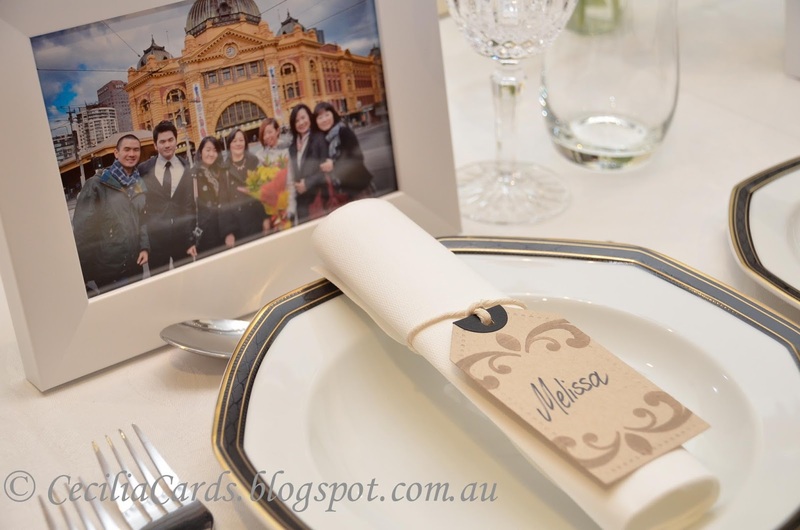 Each guest also received a framed photo I took of them as a present. 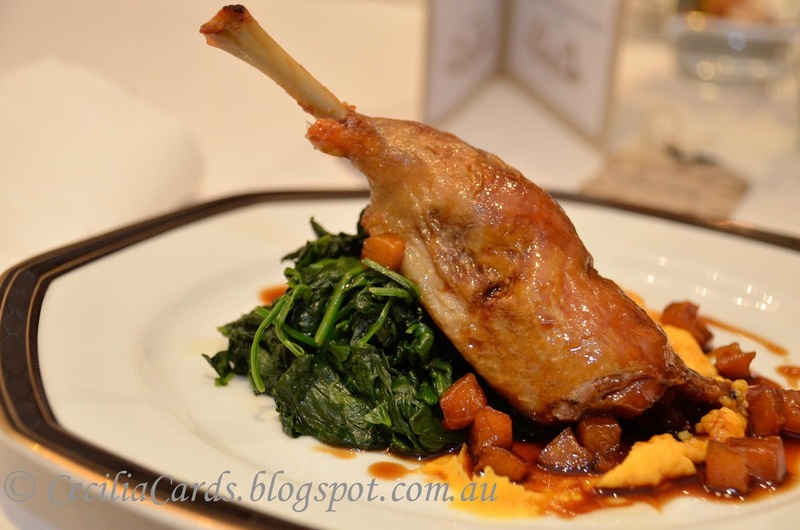 Sorry for the photo heavy blog, hope you enjoy our dinner photos as much as we enjoy eating it! It's been nearly a week since my last post. I have some exciting news! 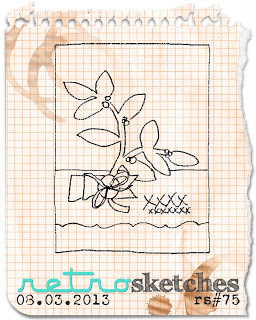 My submission for Paper Craft's Stamp It Techniques V2 was accepted for publication and a whole page will be dedicated to my card including instructions on how to make the card! This is my for Step-Out publication and I had to reproduce some unfinished stamping for the magazine. Not as easily done as I thought! Trust me to use 4 different colours and 20 stamps in the project!! Anyway all done and posted this morning. 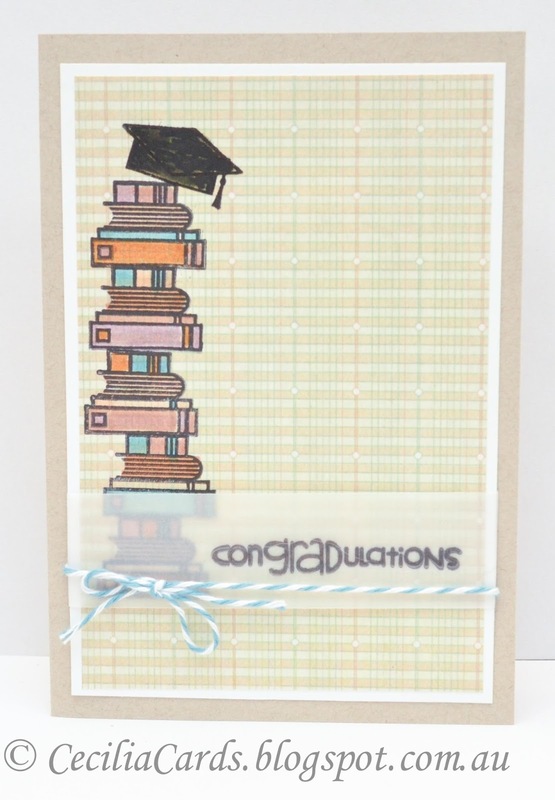 I've been wanting to case this card all week for CASE Study's muse - Jennifer McGuire (the guru of card-making)! Here is my humble attempt to case her card. Thanks for dropping by! This has been a really busy weekend catching up with friends from overseas. 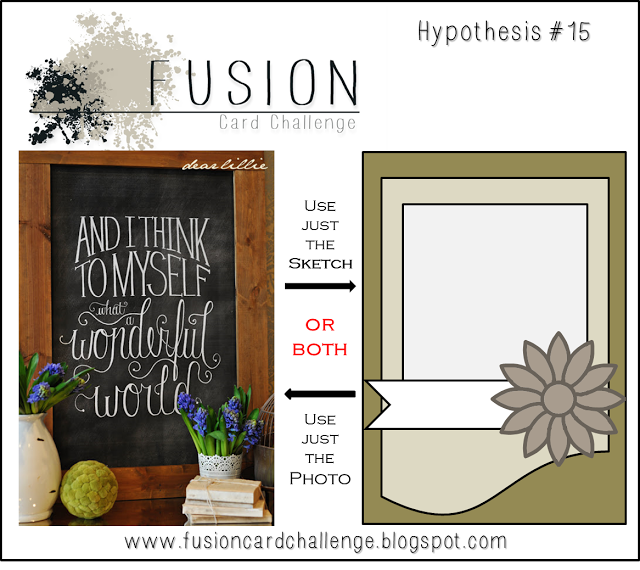 I did manage to sneak into my craft room (after all the housework was done of course) to get this card done for the Fusion Card Challenge. 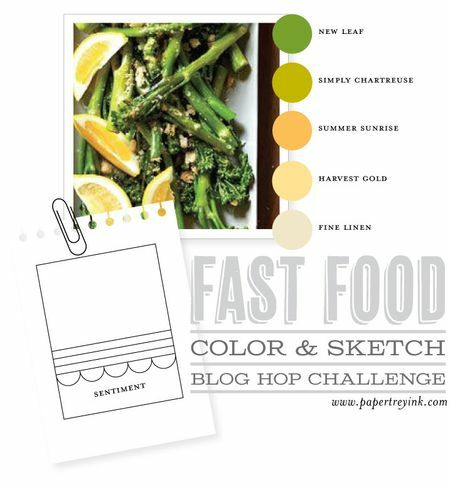 I missed the deadline for the last challenge! Boo! I love the chalkboard technique which I used for the first time here. The difficulty with embossing on black cardstock is that you have to pick one that is not too absorbent. 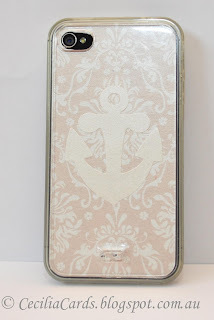 The first time I tried this, the embossing was terrible! Then I tried different card stock (the backing paper for scrapbooking) and got a lovely effect. Recently I was at the local Art and Craft store and spotted a stack of pre-cut papers for $3 and there was a lot of black cards in the stack. I was hoping that it would work and it did! Phew! My card is below with the Fusion trigger below that. 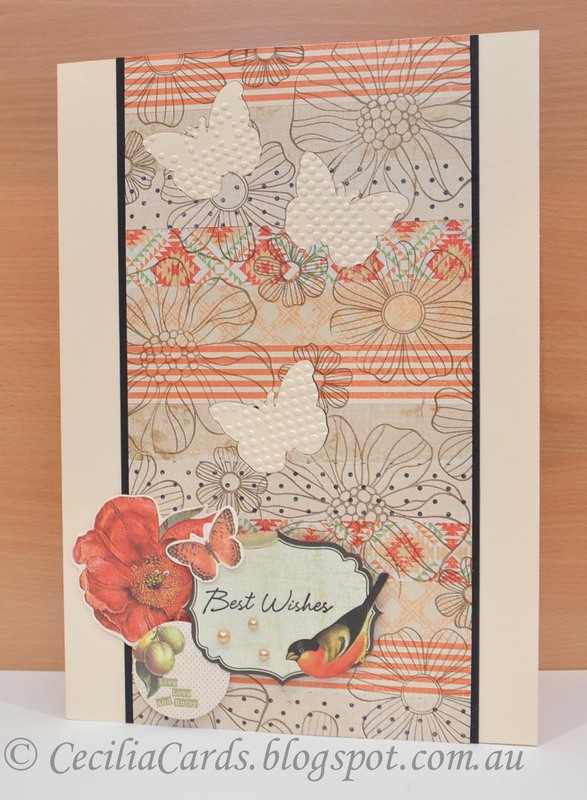 I'm also submitting this card to Moxie Fab World Birthday card challenge, City Crafter's Polka Dot challenge (Thanks Lyndal!) 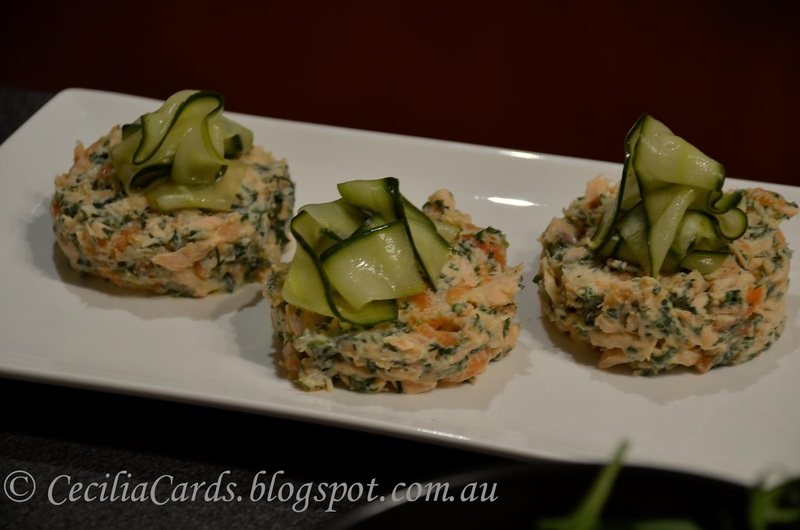 and Simon Says Stamp Monday Challenge - Make the Cut.. Thanks for dropping by! I've got good news to share. I recently submitted a few cards to Paper Crafts's Stamp It Techniques V2. Mind you, I had been very busy and only managed to make one sentiment card using one of the techniques I learnt from the Online Card Class Summer Camp 2. I also submitted a few other cards including the one below which were previously made for other publication calls. The sentiment card got accepted. Yay! ... for Step-Outs... I think this means that they want step-by-step instructions on how the card was made. This magazine will come out in January 2014! 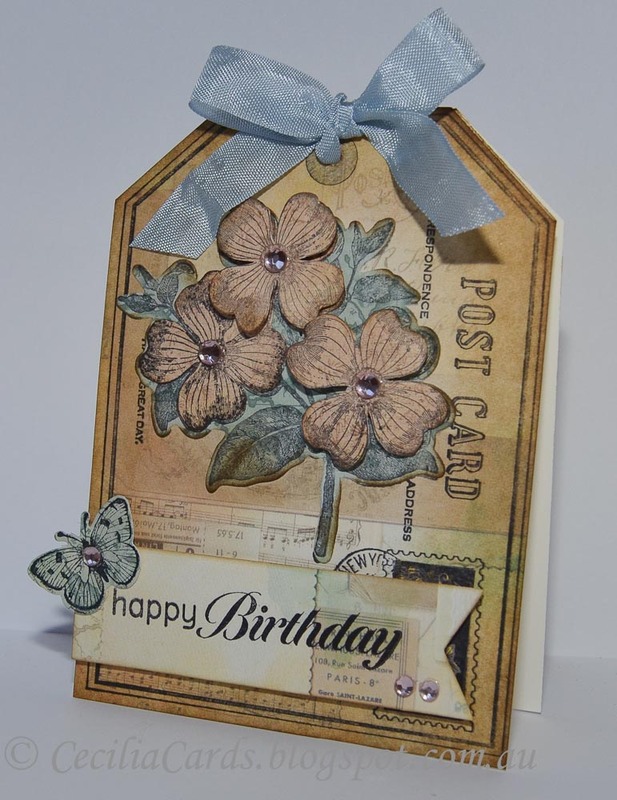 For this card I used my favourite Big Postcard stamp from Hero Arts and added my other favourite flower and butterflies stampset. I'm adding this card to Moxie Fab World Birthday card challenge, Tuesday Trigger - It's Completely Collagical and Simon Says Stamp Monday Challenge - Airmail. Thanks for dropping by! I'm attending a few Graduations this month! 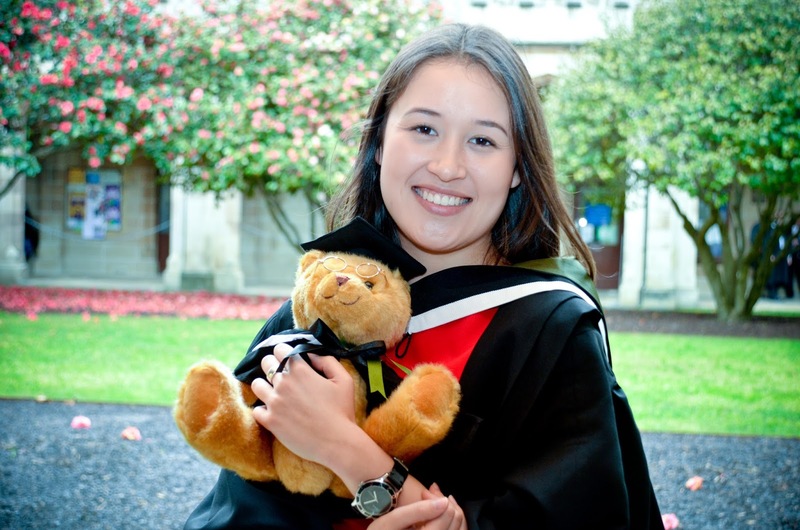 I have already blogged this card I made for my niece who just graduated with a double degree at Melbourne University (Bachelor of Science and Diploma in Language)! It certainly brought back memories as I graduated with the same colour for BSc Hons in 1981 from the same University!! The graduation ceremony is still held in Wilson Hall 32 years later! Oh my goodness, how time flies!! I made two more graduation cards, the first with Retro sketch #75 for Paper Smooches Sparks Challenge - Sheer and Clear. It's the first time that I've inked up the newly arrived stampset from Paper Smooches. I can see more cards coming from this stampset in the future! This second card was made a while ago for a publication submission but didn't make it. 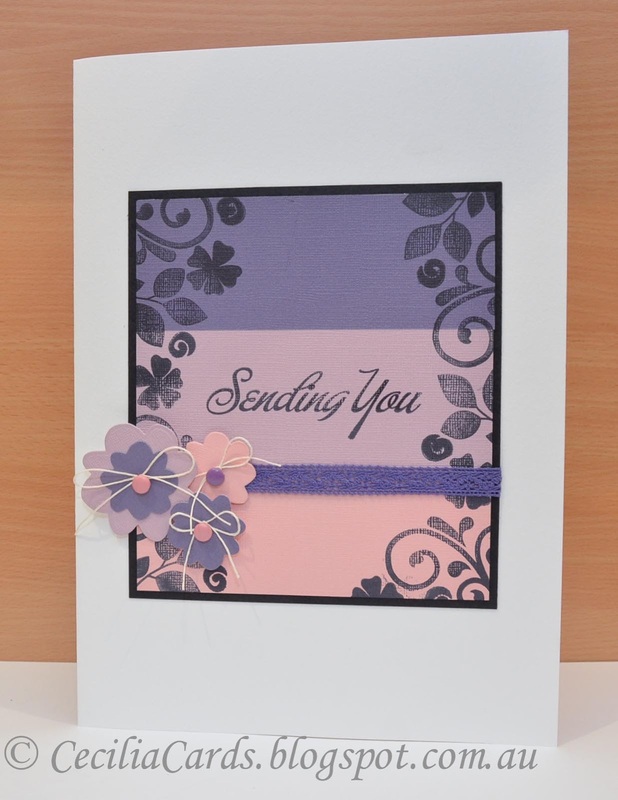 This is made with Fancy Pants Park Bench which gives it a bit of elegance to the card. Two quite completely different cards from two stamp sets! 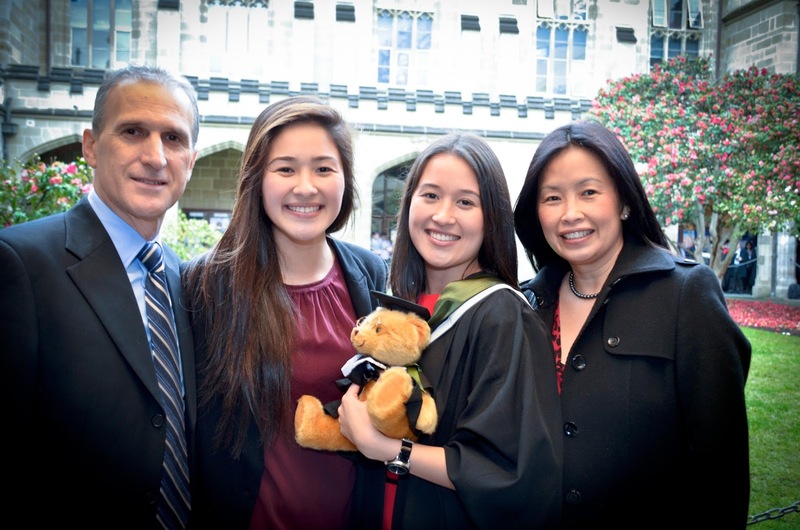 Here are a couple of photos from my niece's graduation at Melbourne University. Aunty Cecilia was the official photographer! Neenah Solar White and Desert Storm, Paper Smooches Smarty Pants, Basic Grey Fiction 6x6, Ranger Archival Jet Black, Tim Holtz distress markers, Vellum, Twine from The Twinery. I had the most wonderful time at my colleague's wedding yesterday. 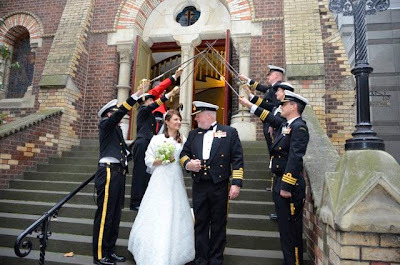 She married an Naval Officer and of course there was a nautical theme to the whole wedding from the wedding invitation to the dress code and the gifts for guests. 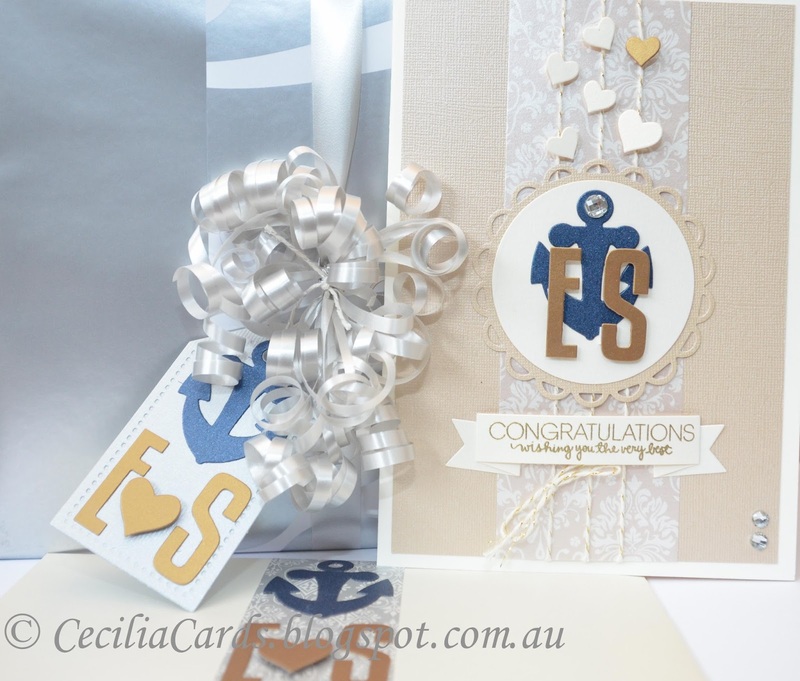 Some of my blog followers would have seen the Nautical wedding card I made for the beautiful couple. I wrapped the presents which came in three parts with the same Nautical theme. To make them all match, I made some gift tags to match the card. Here are my gift wrapped presents which I'm going to link this to Paper Smooches Sparks Anything Goes challenge and Simon Says Stamp Anything Goes. 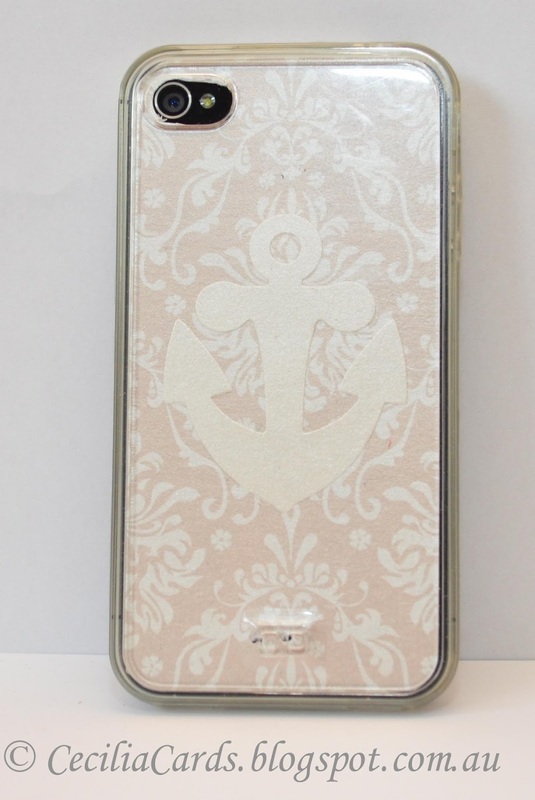 My iPhone cover made for the special day! The lovely couple at St Michael's Uniting Church with a Naval Guard of Honour! 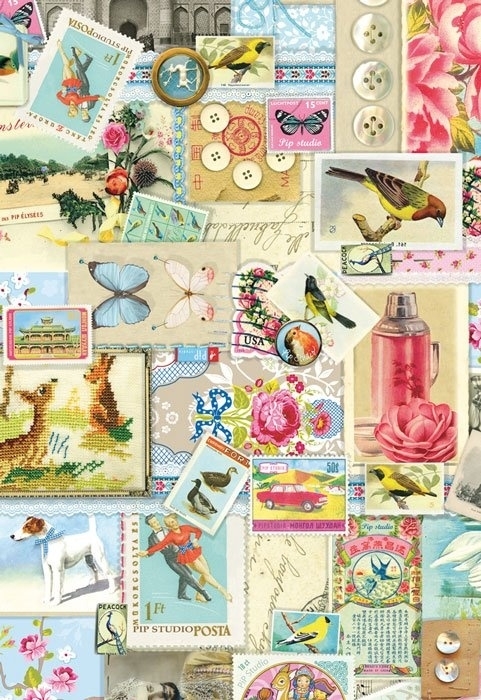 The Kaisercraft Curiosity collection is finally out! 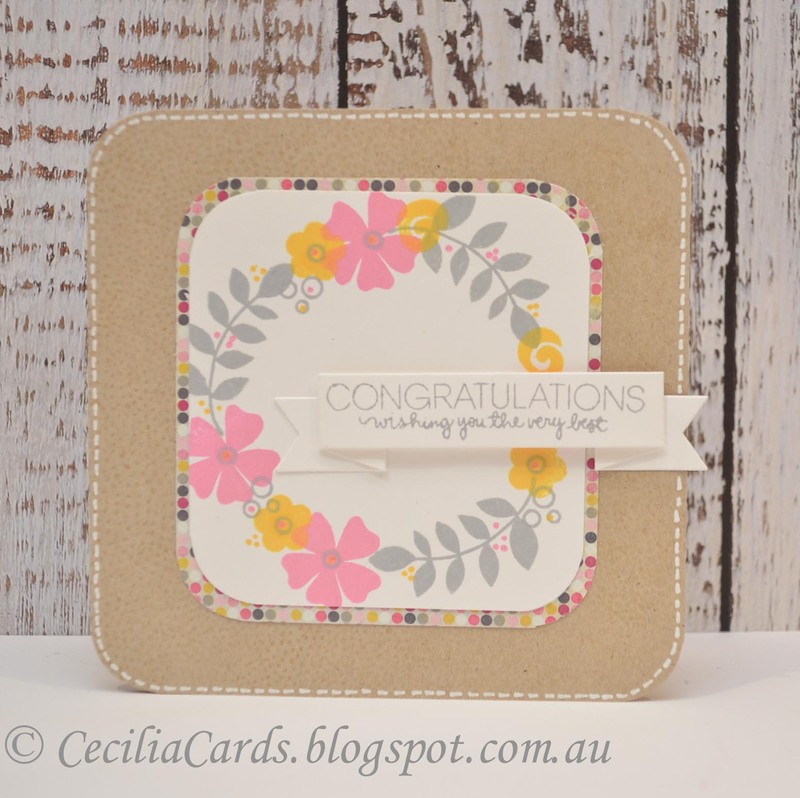 A few months ago, I submitted some cards to Kaisercraft for the 2013-2014 DT call and I got into the second round (Top 20)... I think I might have been #20. Anyway we were given some 12x12 papers from two new collections and had to make a card and a layout out of each collection. I'm showing my submissions for the Curiosity collection below. The photo I used in the layout was one that I took of all the cousins from my side of the family, taken at a wedding last year. My son is the only male, the girls are my sister's and brother's children.It's a rare shot of them all as one of my nieces live in Sydney and the rest are here in Melbourne. 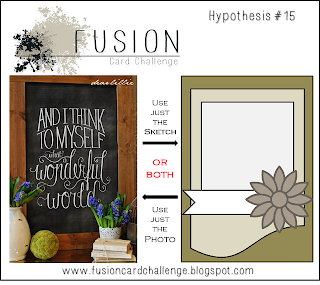 I'm also linking this to Simon Says Stamp's Anything Goes Challenge and Moxie Fab World's It's Completely Collagical challenge. The projects that got through were fantastic, so I'm not surprised mine wasn't in the running. I was encouraged to try again. As I had left over papers, I made a 'Sympathy' card for someone from work. As a lot of people had to sign it, I made it A4 size using heavy duty Canson Colorline cardstock as the base It's a struggle to make big sized cards as a lot of the smaller stamps will not work. I went for my biggest flower stamp, the PTI Year of the Flowers Rose stamp and this seems to fill up the card quite nicely. Banners always work well for these big cards as well. MFW Tuesday Trigger - It's Completely Collagical!